The name 'Harry Tates' dates back to the First World War and was used as jargon for anything clumsy and amateurish. It originated from an old music hall entertainer who would play the clumsy comic who couldn't get to grips with various contraptions. His act included a car that gradually fell apart around him. By the start of WW2 it had been adopted by the Royal Navy and used for the purpose of poking fun at the trawlers and drifters of the Royal Naval Patrol Service. In true RNPS style they took it on the chin and the title of Harry Tate's Navy was proudly adopted. As the war went on it was to become a worthy password for courage. The beginings of the Royal Naval Patrol service first began in 1907 when Admiral Lord Charles Beresford, then commanding the Channel Fleet experimented with the idea of using fishing trawlers as minesweepers. The RNR was generally confined to officers and men of deep sea merchantmen but in 1911 it was felt that there was a need to employ trawlers in war-time as minesweepers and patrol vessels. The Royal Naval Reserve Trawler Section - RNR(T) was set up to enrol the necessary personnel. Although abolished as a separate section of the RNR in 1921, the RNR(T) always remained quite distinct from the RNR proper, and employed fishermen. 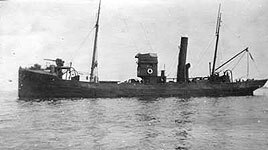 In both world wars a large number of trawlers were taken up by the Royal Navy complete with their crews, who were entered on a form T124 by which they engaged to serve in a named vessel for the duration of the war only. Fishermen on a T124 formed the bulk of the RNR(T) during the First World. The RNR(T) wound up in 1921. Many lessons had been learnt about the real threat of mine and submarine warfare during the First World War and by the time of the out break of the second world war, the Admiralty was better prepared, as a force it was still considerably under strength. By 1939 it had only grown from 300 requisitioned trawlers to 400 with a Patrol Service personnel remaining at 434 skippers and 3,733 ratings. These trawlers were split thus, 200 to be used for minesweeping and the remaining 200 for patrol work. All that remained now was for the Patrol Service to have a suitable assembly base and 'Sparrows Nest', the municipal pleasure park on the seashore at Lowestoft, was finally chosen. The name 'Sparrows Nest' originated from one of its former owners and before a pleasure park it had been a country estate and one time home of the Marchioness of Salisbury. To begin with the Royal Naval Patrol Service was mostly manned by the skippers, mates and men of the Royal Naval Reserve. The communication ratings were all from the white-collar world and the crews and their skippers were fishermen. 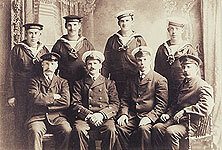 To ensure that at least some Naval discipline was observed, senior ranks of the Royal Navy and RNR were enlisted. However, it was a well known fact that the fisherman did not take kindly to naval discipline. They were stubborn, independent and tough men and they knew their place at sea better than any man. As the hostilities wore on more trawlers were requisitioned while others purpose built. To meet this increasing demand, fresh naval recruits with mostly no previous experience of the sea came flooding into the now busy and chaotic base at Lowestoft. As time went on, things began to change and more Royal Naval discipline was implemented. Later the base changed it's name to HMS Europa. I am told that the Minesweepers men have no badge. If this is so it must be remedied at once. I am asking Mr. Bracken to call for designs from Sir Kenneth Clark within one week, after which production must begin with the greatest speed, and distribution as the deliveries come to hand. The finished design took the form of a shield upon which a sinking shark, speared by a marline spike, was set against a background made up of a fishing net with two trapped enemy mines. This was flanked by two examples of the nautical knot and at the top the naval crown. Beneath the badge was a scroll bearing the letters M/S-A/S (Minesweeping Anti-Submarine. The shark symbolized a U-boat and the marline spike the tool of the Merchant navy. The net and the mines were both symbols of the fishermen who now found themselves at war seeking a new deadly catch. Never before had one section of the Royal Navy been similarly honoured.